I’ve never hidden my love for Japan. I got engaged there and had my honeymoon. I’ve loved every second I spent in the country and I make no bones about my being one of ‘those people’, the ones who inbibe the culture in any way they can; music, anime, games, documentaries, cinema and literature, its how I fill my free time. The reason I bring this up, is that as a japanese nerd, we can smell our own. The world built in The Friends of Ringo Ishikawa is familiar to anyone who’s dipped their toes into the media of Japan. The characters match the stereotypical representations seen in Asian cinema and the story is something told before. In spite of all of this near retreading of familiar ground The Friends of Ringo Ishikawa manages to be something altogether different. The Friends of Ringo Ishikawa revolves around the day to day life of a teenage delinquent and his classmates and gangland brothers. All have aspirations both in terms of their interests and careers but also seem keen on the world of the Yakuza and strive to be the top clan in the area. Through infrequent cutscenes and conversations you start to realise early on that this game is not anything like how you expected it to be. 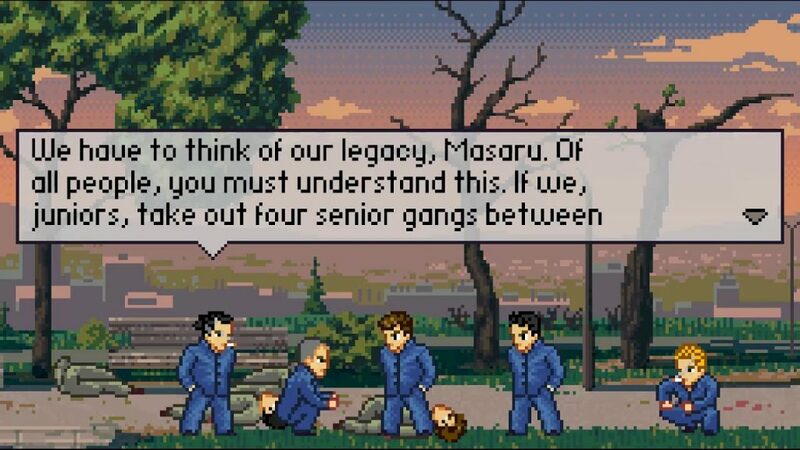 Rather than be an all out action game The Friends of Ringo Ishikawa is a fascinating cross between River City Ransom and Shen Mue or Yakuza. The thrust of the game isn’t the combat, it’s an added bonus, almost like a mini-game buried in an interactive Visual Novel. You’ll find yourself fascinated by the interactions between the characters. The writing at times reads a little stilted and forced, none of it is game breaking exactly but there some amateur dramatics immersion breaking going on in some cut scenes. The game plays out in an open world with a day night cycle, shops open and close and areas become less or more populated as time goes on. As you roam the streets you’ll pass numerous delinquents from others schools, their different coloured uniforms making them stand out. There’s a button dedicated to walking tough, with your hands in your pockets, this has the ability to launch into your combat stance with another press of a button. The Friends of Ringo Ishikawa’s biggest problem is that it really doesn’t explain anything about itself, its world or how anything works. Learning how to save the game took me over an hour (Go to bed in the answer), health regenerating isn’t related to food as i assumed for a vast majority of the game, but instead is down to crouching and having a smoke. This game is laden with mechanics that just aren’t explained, this isn’t monster hunter where you are supposed to have a wiki open the whole time, but instead I did find myself running off to the Steam forums just to piece together what I was meant to be doing. Being open world means the game is lacking something that it really needs, focus. A lot of my time during my first play through was trying to work out where I was ‘supposed’ to be going, the game is huge with many different locations you can hit up. More often than not I progressed the game by accident, a character appearing where no one has been for hours or my exploration leading me into school in time for a history lesson where I bump into someone who wants to go for a meal with me and talk about their hobbies. It’s a world that doesn’t hold you hand in anyway, and that isn’t entirely a bad thing, it means you area immersed in this small town that goes on day and night. You have no choice but live a life there, not everything happens in a day in real life. Where The Friends of Ringo Ishikawa truly excels, and deserves all the credit humanly possible is its design. The back drops are absolutely gorgeous a truly awesome testament to the skill of the artist that worked on them, both day and night the scenes you are presented with all deserve your attention. Thankfully there are dozens of locales that allow you to interact with the scenery, be it sitting on a bench or leaning on a railing staring off into the distance or my personal favorite is the stare out over some water like a character from Dawson’s Creek. The music is a great mix of chill-hop and jazz, the perfect accompaniment for those long runs across town to get home from your school or cave in the skulls of a rival gang. Something that also deserves attention is the character models. 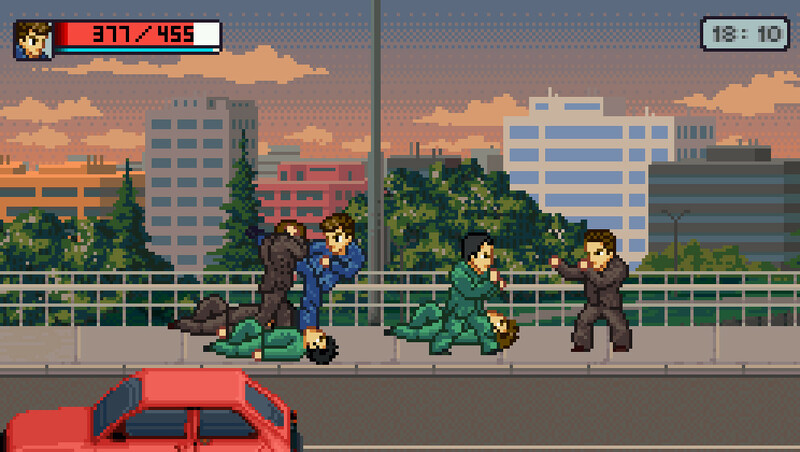 Obviously inspired by River City Ransom they all animate wonderfully with the pixel shadows flowing awesomely over the material of the school uniforms. 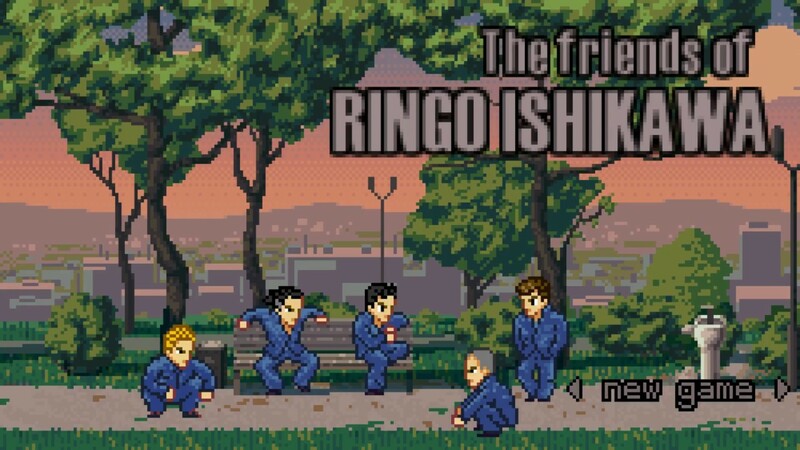 The Friends of Ringo Ishikawa is a game that thrives in it’s trailer and gif presentations over social media. The design of the world and the flow of the town all look wonderful and the game itself is a blast to experience. The game isn’t without its issues however, the lack of hand holding in the early game will be enough to put off a lot of people, there are plenty of opportunities to slip in a little bit of help text to explain the point of certain mechanics but instead the player must work these out for themselves whilst also trying to navigate a sprawling town and a story that isn’t even remotely spoon fed. Once you’ve worked out the buttons and what is required of you The Friends of Ringo Ishikawa is a deeply fascinating experience that looks to have aimed big and tried something different and succeeded. It’s a cliche but The Friends of Ringo Ishikawa genuinely feels like it’s more about the journey rather than the destination.